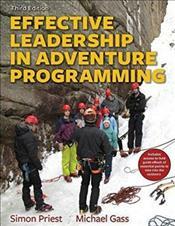 Some books address outdoor leadership; others focus on adventure programming. None delve into the specifics of both topics like Effective Leadership in Adventure Programming, Third Edition, does. The first edition of this book helped define the body of knowledge for an emerging profession. Two editions later, this groundbreaking text.now in full color.provides adventure leaders with the tools and evidence they need to show that their outdoor programs are effective and have a lasting impact on their participants. Internationally renowned authors Simon Priest and Michael Gass have significantly updated the content, based on the latest research, issues, and trends in the field of adventure education and leadership. They have reorganized chapters to conform to their new model of building core competencies. ... Effective Leadership in Adventure Programming will help readers understand the four adventure program areas.recreation, education, development, and therapy.and how they influence the delivery of outdoor leadership. The book is a valuable resource for the training and education of future outdoor leaders. It will help readers know why they should work in the profession and understand how they can make a difference by being an effective outdoor leader.